This has been the background on my phone for the past few months. Each time I see it though, I remember how important it is to really believe it. It would be easy (it is easy) to doubt God’s goodness when things go wrong or the answer is “No.” Likewise, we often have an easier time believing He is good when the path is easy and the burden is light. Accurate understanding of God leads us to the belief that God is good no matter what. We can believe that His plan and purposes for us are good, because He is good Himself. Nothing that comes from Him is anything other than fully good. 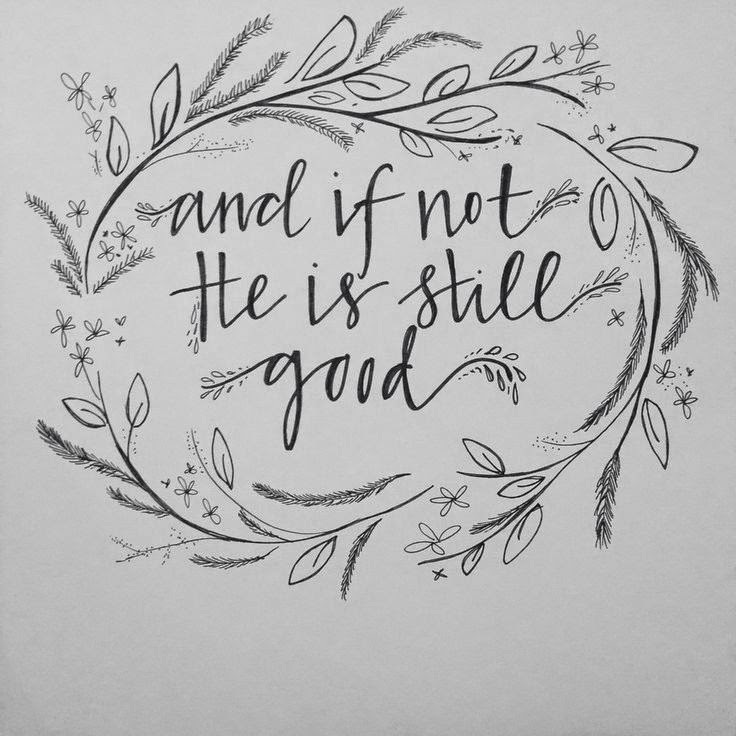 It seems a simple truth, one that seasoned Christians might easily gloss over; but stop and dwell on those words: And if not, He is still good. What in your life could be the “if not”? A job? Relationship? Promotion? Finances? We know that we can ask God and He will answer…however, He does not promise that the answer will always be yes. Know that in the “If not” situations of your life – He is still good. Receiving a “no” does not contradict His character, it just helps you know in what direction you are and are not supposed to go. He is a God who leads us, slowly and steadily; He invites us into a life of abiding with Him, where we can be certain that no matter His answer to our requests, He is a good God. Instead of asking for God’s response to always be yes, ask that in all things you would know His character. Seek to remember and be confident of His goodness and faithfulness to us. Remember the times He has said yes, and contemplate the times He has said no. All that He does is for our benefit, for the purpose of glorifying Him with our lives. When we live seeking who He is rather than what He can do for us, everything changes.